Orig. by controlled cross (‘Schley’ X ‘Barton’) made by L. D. Romberg, USDA-ARS, Brownwood, TX. Cross made in 1949. Scion budded into bearing tree in 1950, bore first fruit in 1955; tested as 49-17-166 by Romberg and G. D. Madden. Released in 1968. 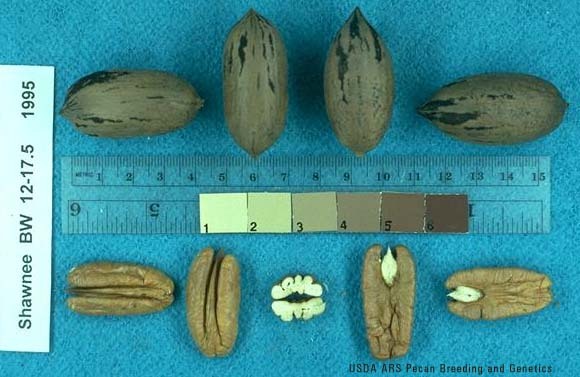 Nut: oblong, with obtuse apex and base; round in cross-section; shell light brown with few dark stripes; 48 nuts/lb, 58% kernel; kernels golden in color, with very narrow dorsal ridge. Protogynous, with mid-season pollen shed and early to mid-season receptivity. Medium precocity, productive. Ripens early mid-season, one week before ‘Stuart’. Susceptible to scab, but manageable with fungicides. Extracted from here.